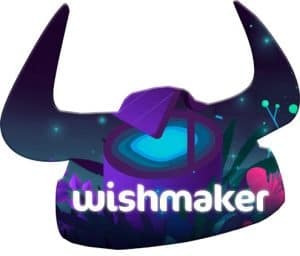 Wishmaker | The viking made a wish at this cool new online casino! Wishmaker casino is a brand new casino from a brand new developer. Take part in a whole new casino world (according to them at least) while playing at some of the hottest new video slots! You will also be able to start an adventure and choose your own way in this tailor-made new online casino from 2018! The Viking has said his words about this and is really impressed about this brand going beyond most of its competitors. Now you finally get a new casino site that really offers a lot to its players. Even though it is totally new and wasn’t even launched at the time we got the review from our Viking hero, we still got some nice info that we want to share with you. Wishmaker casino certainly seems to be one of those that are here to stay! When our Viking started his quest at Wishmaker casino, he was intrigued by the looks of it. He thought the sign-up process was developed in a nice way, even though it is not the easiest one on the market. However, this gave him a sweet start and he could already see the really nice features this casino has to offer all its players. He got himself an email and approved his account. Then he thought it was time to check out the games. Even though we, as well as our Viking, really appreciate a website with nice looks and an adventure platform with many features – the games are always at the very center! This is why we asked the Casino Viking to check it out thoroughly. And he did. This is your typical slots casino. Even though you surely will find some other games as well, this is what you can expect. This is the Vikings’ favorite games. Due to this, he was more than happy trying them out. And many game providers are there waiting for you. NetEnt, Betsoft Gaming and Yggdrasil to name a few. All in all, there is not much to complain about when it comes to the games offered by Wishmaker online casino. So, what more did the Viking check out during his review? The whole new world of online casino that Wishmaker offers is big. An adventure casino with fun characters and new features, promotions and such all the time. This makes this a great place if you want to gamble often, you will never get bored at this casino, according to the Viking. But, as he said, if you are looking for a quick “register and play” type of brand, this might not be the one for you. However, it looks very neat! Have a look for yourself and see if you like it. The Viking says he thinks that Wishmaker casino is one of the best ones this year. We can’t disagree.